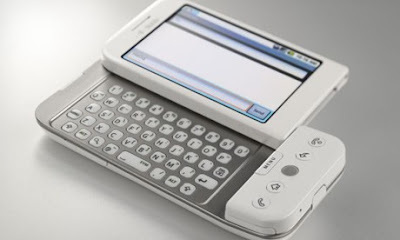 Kim Unplugged: Randomness: T-Mobile's G1: Great QWERTY Keyboard Option but Dreadful Battery Life! T-Mobile's G1: Great QWERTY Keyboard Option but Dreadful Battery Life! I've been using my T-Mobile G1 mobile for a month now and love the QWERTY keyboard, but hate-hate-hate the battery life! To be honest, at first I was a bit bummed that Nick didn't get me an iPhone since I had never even heard of T-Mobile's G1 and was rather skeptical about how it would even compare to Apple's iPhone. However, a few weeks later I found myself becoming a G1 advocate. The feature that won me over was the option for a QWERTY keyboard and a touchscreen, although I hardly ever use touchscreen. I am a heavy texter and send loads of emails everyday and couldn't imagine using a touchscreen for all my communication. How do people with iPhones manage to send texts and emails without driving themselves mad? But of course the G1's not perfect, yet that is. Aside from the wretched battery life (130 hours standby vs. 300 hours standby on iPhone), to enlarge contents on the screen, you can't simply spread two fingers apart to zoom in like you can with an iPhone. It's a bit more complicated. If you're lucky, a pop-up appears at the bottom of the screen for you to click if you want to enlarge or reduce the image. However, the pop-up doesn't always appear and you have to tap on the screen and hope that it pops up without you 'accidentally' clicking on another link on the page, which will redirect you to another page/site. This can be aggravating when you simply want to enlarge text. For my specific communication preferences and needs, T-Mobile's G1 has my vote! For a more in-depth review of T-Mobile's G1, visit CrunchGear and read Peter Ha's comments or check out PC World's iPhone vs. G1 story here.